501 and 502 are still out in plain red (I believe) with 503 the first to get the full RED FLASH treatment.You will note the slight difference with the others as the "Up to every 10 minutes" lettering is missing from the rear wedge. 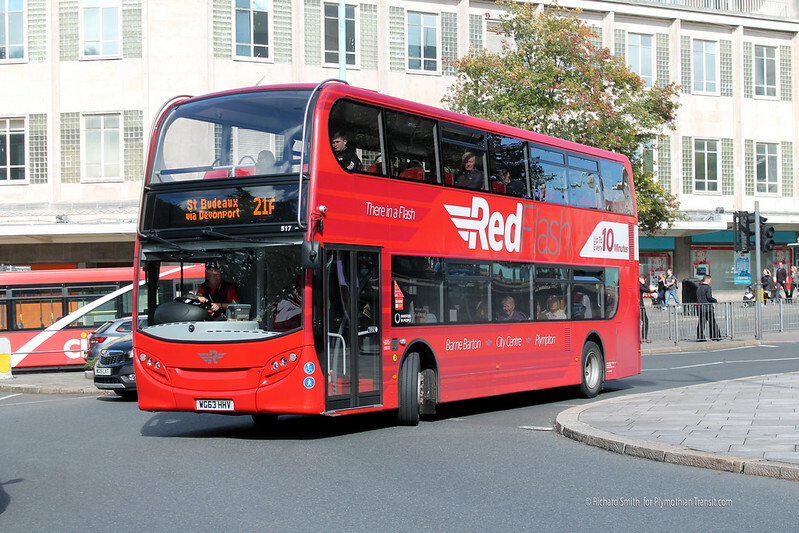 The reason these have been repainted red is due to the increase in frequency for much of the route. Thanks to Lauren for the top photo and Richard Smith for most of the others! I can see from your fleet list update that both 136 and 58 had 'major accident off road.' does this imply they hit each other? Did they have separate accidents and if so, do we know how? 136 was between St Issey and Little Petherick; the last bit of the Padstow route 75. 58 was hit by a lorry in Saltash, on an 11 inbound to the City. 65 has also suffered an RTC on Wolseley Road inbound the other week too. I was expecting one of the accident spots to be between Liskeard and Looe. Much of the road through St Keyne to Duloe is that 'in between' width - wide enough for two small cars to pass, but not wide enough for a car meeting a bus. Car-drivers go too fast and suddenly get a shock. DAC Coaches gave up that route - which they were running with full-width Solos - because they had had too much expensive damage to their buses there. They were early Solos, with vulnerable parts right at the front - a fault they shared with the Alero. Will these buses be repaired or are they write offs? All will be repaired. 58 is almost done, 136 is progressing. However 65 is in the raised depot and awaiting one of the two to be finished before that goes in for repair. They do such a good job; look at 77, for instance! I think the plain red livery on the E400s looks better than the swooped livery. Not convinced by the Yellow Flash, can't read some of the branding. Not been a great time for bus accidents. 136 and 58 (anyone shed any light on what happened), 92 on North Hill Road other evening and 417 had a minute shunt with a car today (no major damage to each bus or car). So which Enviro is in the Cornwall Transportation Expo 2015 exhibition at Newquay Airport in GoCornwall livery then? Anyone know if it's staying in that livery or if it's just a fake for the display? I believe 531 has received Go Cornwall names. I guess its a temporary arrangement though? 531 is lettered up for Go Cornwall for two to three weeks. err, thats because its a news post on the latest changes to the Citybus fleet of Enviros, as explained in the first line of the post. 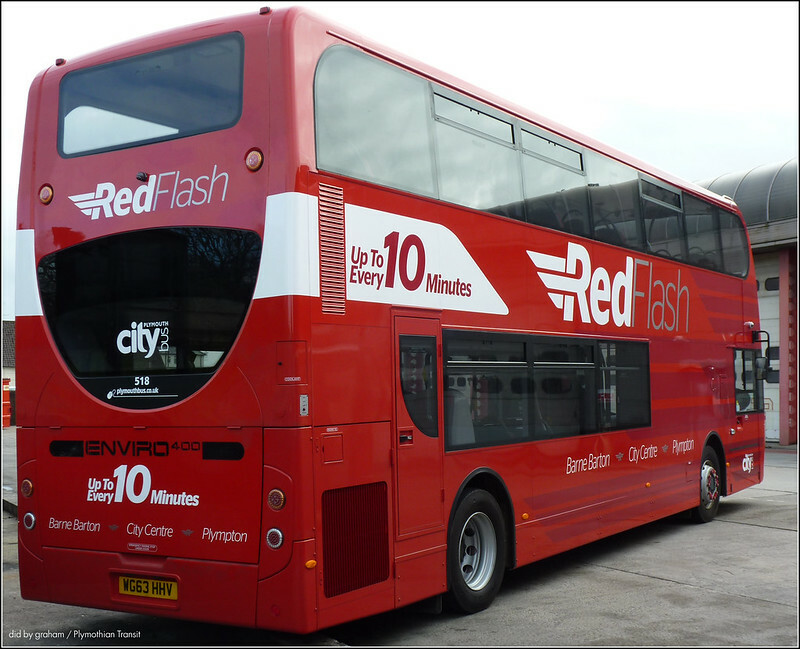 Given how 90% of the buses now on the roads in and around Plymouth are CityBus vehicles, how is it funny. I'm no fan of bus drivers, some are dangerous and need retraining or removing from duty. However, the vast majority of trouble on the roads around here are the morons who drive cars that don't use the magical sticks on the steering column called indicators. Or they seem to think the bus drivers are telepathic and can tell when they are suddenly going to pull out in front of them. 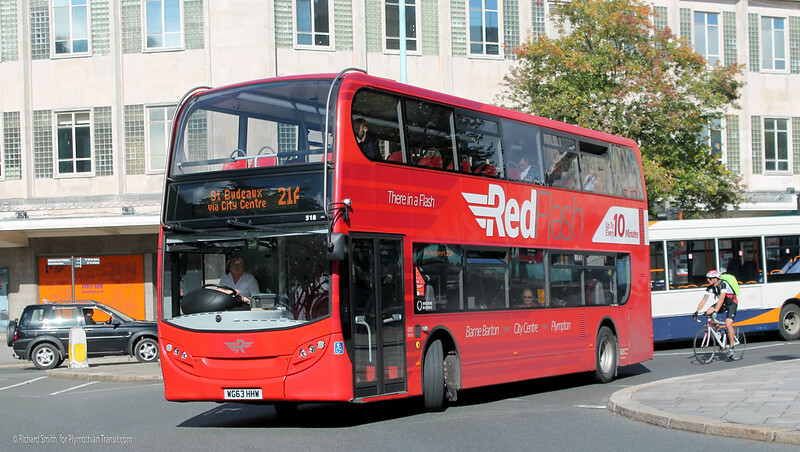 Trident 484 now in red swoop livery and Eclipse 107 in blue flash livery. Dart no. 2 (last of the early low floor darts on site at Milehouse) was stripped for spares last week and presumed towed to the scrapyard. Small Solo 209 in use today (Monday) on 16 and 33s. Apparently passengers had to be left behind during the evening rush. I spotted a Go Cornwall Solo on the 20A several times last week. Route branding seems to be working at Milehouse NOT! Pretty much a daily occurance at the moment, at least one on 20/20A. And on 25s and 16/33 too. These buses are too small in capacity for these services! Saw a Solo working on the 40 and 41 today. Bet that was fun in the rush hour! ..also, why take swooped ones off and not ones in stenning livery? It reminds me of a certain other bus company who's just pulled out of Plymouth!!!! No they haven't. They've showed a concept of a new livery which they are consulting stakeholders partners and customers on. It's likely that they will roll out a green brand but not that exact livery, for their public bus routes. It is likely to be on a route by route basis though as vehicles are upgraded. Using any livery other than standard First or Buses of Somerset green would be complete madness. We all know very well that buses won't get repainted when they transfer, so why on earth would one business want to exacerbate the situation by having two different green liveries in Cornwall and Somerset? Oh for heavens sake drop the drama. It's only 'complete madness' in a world of people who take issue with the runnings of operators they know nothing about and are not at all informed about. If you knew the context, the strategy, the future plans for the business, then your opinion of whether the painting of buses was complete madness may be of some value, but you don't. Presumably you think Citybus are completely bonkers and need the men in white coats to visit Milehouse now that they have painted a blue bus red etc. etc. etc. There are very good reasons why I made the comment and yes, Citybus are finding out just why multiple liveries cause various difficulties and extra costs, lessons that their colleagues in Brighton and Newcastle (for example) learned some time ago but given your clear intolerence to anyone else having an opinion I shall leave it there. Why withdraw 429 and 439? These are Y reg and 429 carried a citybus own wrap. Both were in swoops, so why not withdraw 420 and 421 (in stenning) which are both W reg, which would match up with 430, 431 and 432. Seems a bit off. Also, why take any swooped ones off the road when the likes of 18 and 19 R-reg darts still run, and other buses carry stenning. Another option would have been to have taken the mini solos off, I know they are much newer, but the deckers would have carried better loads on routes like 41 in the rush,or even the long run on 20A. As far as I know 58, 65 and 136 are all being repaired. May find 65 gets a repaint on its way out. 504 - In going red. Anyone know whats next? 108? Markings of 501/502? Something else for swoops? 108 and 109 will not be painted Blue; these two are used on the Service 10 and 12. It's good to see First investing in new vehicles, livery and logo for Cornwall. 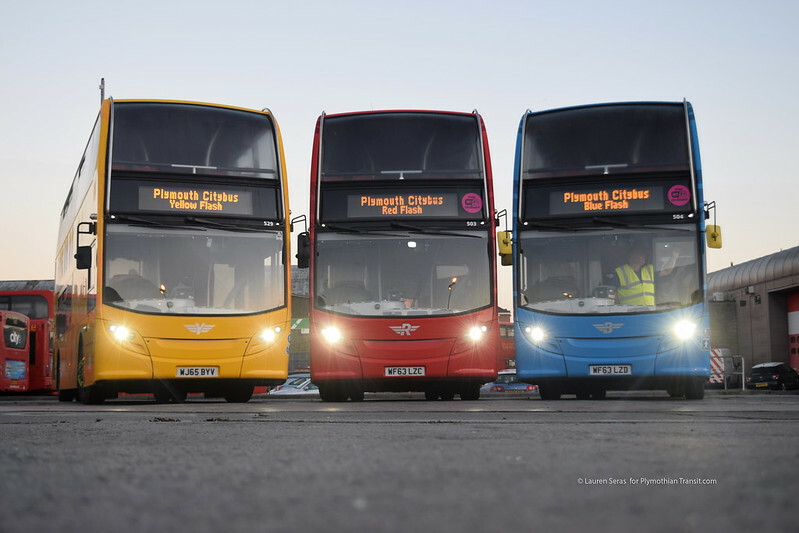 In comparison all Citybus could muster up is an Enviro pretending to be Cornish when everyone knows it will be rebranded next week for Plymouth and older vehicles used in Cornwall instead. Such a turn around compared with 12 months ago. Lets wait and see - At the moment there is no firm commitment to invest in new vehicles, this Enviro could just as easily end up being repainted and dispatched elsewhere by First. I agree that there does seem to be a good turnaround by First in Cornwall though! Or maybe there is. It could just be that the commitment has been made but not publically. The 12 plate Enviros aren't going anywhere. No doubt we'll soon have various posts telling us where they are moving to. What a shame that green Enviro couldn't have been in the line up above with the yellow red and blue buses! 429 - 432 and 439 are marked not to be stripped for spares and are believed to be on their way to another bus company (Chambers?). 426 also believed withdrawn. Dart 2 still in lower yard and will be towed to scrapyard on Thursday (8th October). 531 now in swooped livery in paint shop. 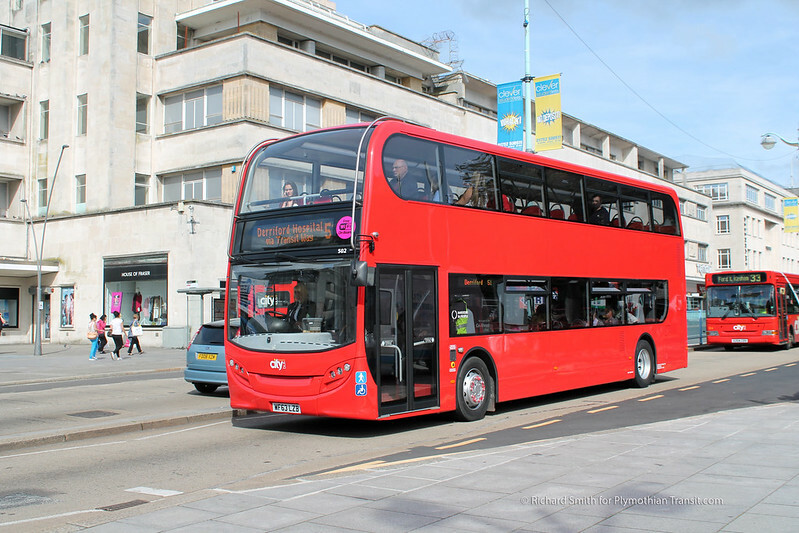 484 latest Trident in red and 531 back in service in swooped livery. Saw small solo 207 on the 28 and 28a yesterday. A bit weird when serviceable deckers are being withdrawn. There was a small solo on the 25 the other day and it was packed before it left Royal Parade. The 28's need bigger buses, and the Citarios were working very well. I don't see any other use for the little ones other than prehaps the short run 34A. Why were they taken off the narrow roads of Cornwall? - did the route become too busy for them (like the Plymouth routes). Another option for them is prehaps a new 21B service - to run a little circular from St Budeaux back around Barne Barton.